I was directed to contact you concerning some documentation of an illegal private landowner No Trespassing sign I came across when I was on Swimming Woman Road last week, going to the Big Snowies, Lewis and Clark National Forest. If you would please call after receiving this email, I would appreciate it. If you are not who I need to contact about this, please advise me as to who I should contact in Golden Valley County. 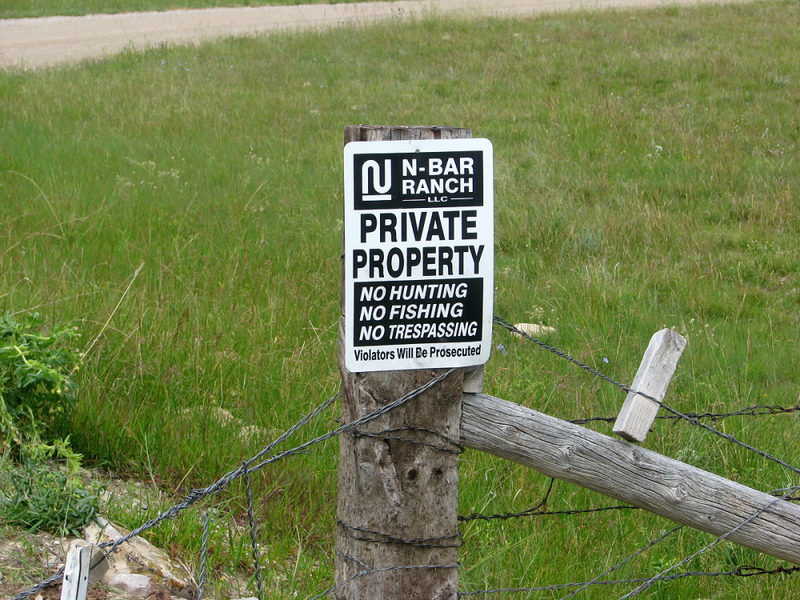 The sign, is contrary to MCA 45-8-115 which states that it is illegal to post on state or federal land, to restrict access or use of state or federal land; as well as MCA 45-6-201 which states " (3) To provide for effective posting of private land through which or along which the public has an unfenced right-of-way by means of a public road, a landowner shall: (a) place a conspicuous sign no closer than 30 feet of the centerline of the roadway where it enters the private land, stating words substantially similar to "PRIVATE PROPERTY, NO TRESPASSING OFF ROAD NEXT ___ MILES"; or (b) place notice, as described in subsection (2)(a), no closer than 30 feet of the centerline of the roadway at regular intervals of not less than one-fourth mile along the roadway where it borders unfenced private land, except that orange markings may not be placed on posts where the public roadway enters the private land. " 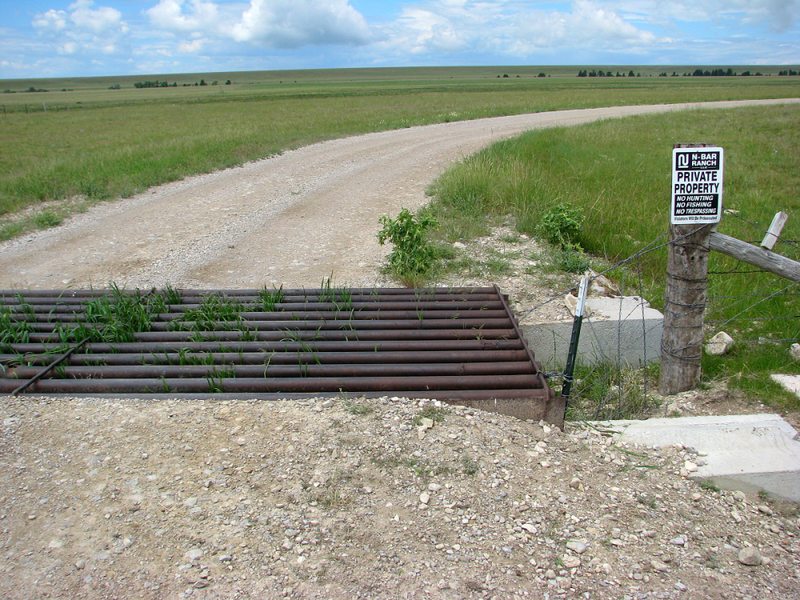 I already knew this was a public access county road from work done by the Public Lands and Water Access Association, previously, otherwise, by all indications, the Wilks N-Bar Ranch sign makes it appear that by crossing that cattle guard and proceeding forward you are trespassing and will be prosecuted. All other landowners signs beyond this point have them properly on their fences parallel to the road. The Wilks sign is on a post, about 3' from the edge of the cattle crossing grate; from centerline of the road, it is about 12'. 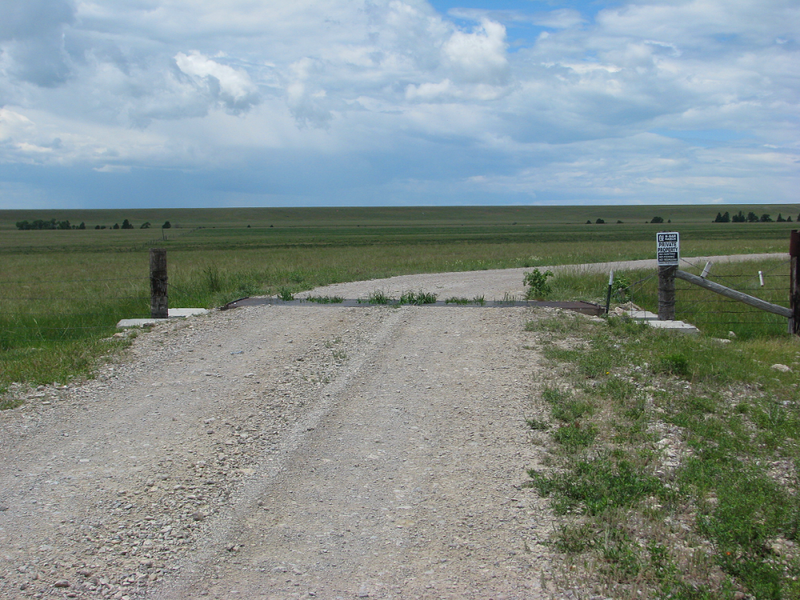 This cattle guard is on the border between S22, T10 N, R19E, N2NW4 and S22, T10N, R19E, NE4, NE4SE4. I was having difficulty with my gps and sun glare trying to take a picture that was visible, so I believe the coordinates are 46°37' 04.34" N 109° 18' 55.27" W. Below are some pictures, including location on the map.